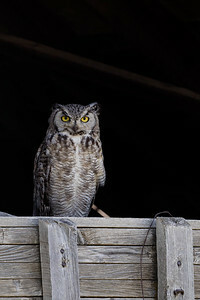 Owls-Please click on photos to view and purchase. 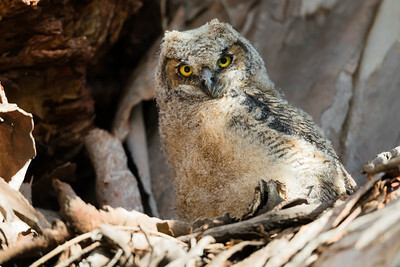 A protective mother great horned owl careful monitors us as we observe her owlets. 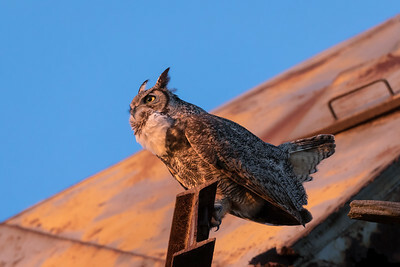 Evening light does magical things to the image of a great horned owl. 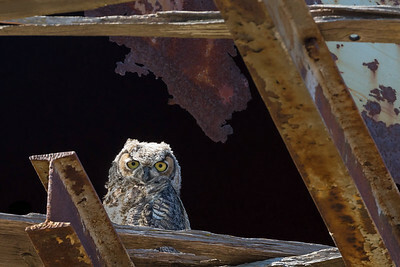 A Great Horned Owlet Observes From the Safety of an Old Water Tower. 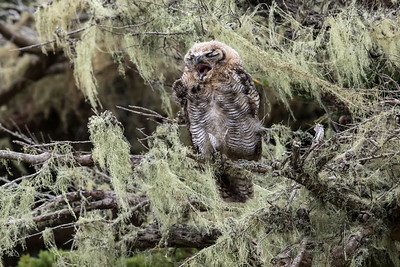 This Great Horned Owlet kept up its cries to be fed all day long in Point Reyes National Seashore. 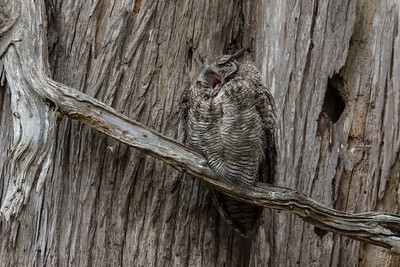 While hiking through pastures and small groves of trees in Point Reyes National Seashore we heard the plaintive call of an owlet to its parent. 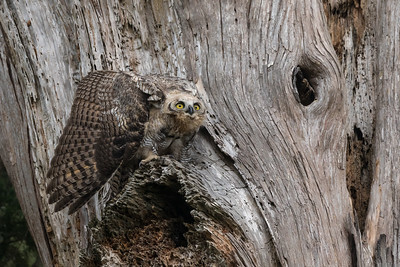 We followed the calls until we spotted this juvenile Great-horned owl in an old dead tree. We photographed and observed from a respectable distance and were surprised when a Cooper's Hawk flew overhead. 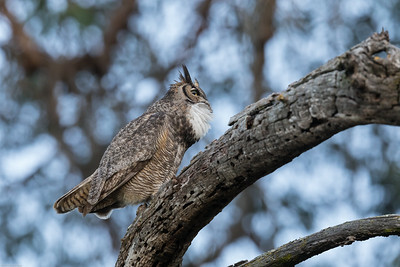 Immediately the Great-horned adopted a defensive mantling posture until the perceived threat few away. 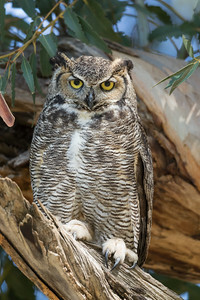 While hiking with our camera gear in Morro Bay we happened to hear the hoot of a Great Horned Owl one morning. 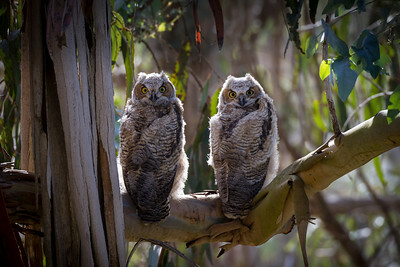 We followed the sound and spied two Great Horned Owlets intently staring at us from their perch high in a eucalyptus tree. 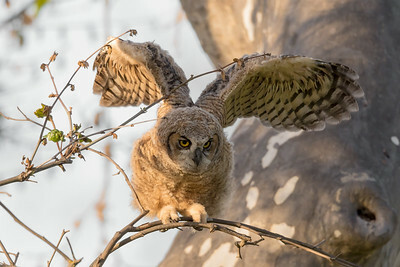 Great horned owlet strengthening its wings in preparation for its inaugural flight. 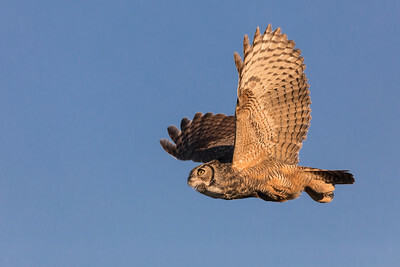 As the light began to fade a male great horned owl began to calling to his mate. It is breeding season and these tigers of the night are in full courtship mode. 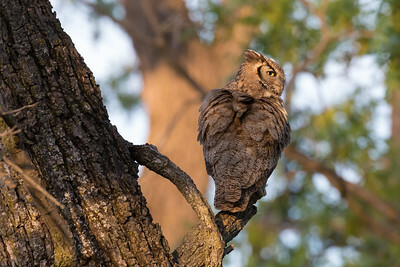 It is breeding season for great horned owls and as the light started to fade this pair of owls began calling to one another. 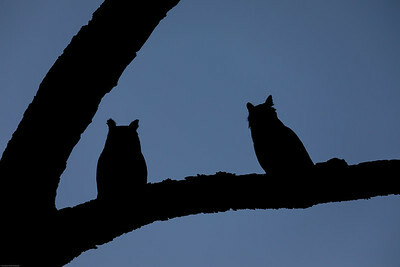 Then as the world turned dark they flew onto the same branch and continued their enchanting hooting serenade. 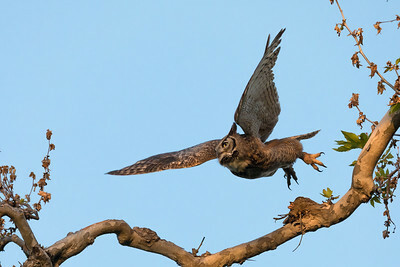 Great horned owl taking off! 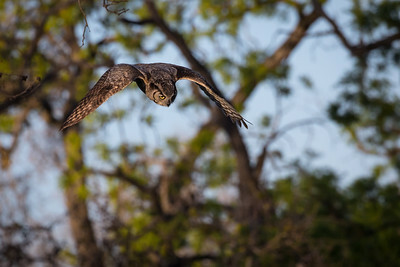 A great horned owl hones in on potential prey and quickly and silently dives off the branch where it was purched. 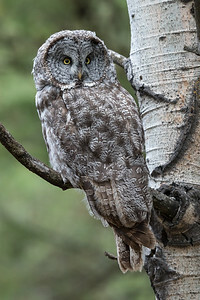 We witnessed an unexpected moment of activity as the male and female Great Gray Owls (Strix Nebulosa) exchanged a vole in an aspen tree to bring back to the nest to feed their hungry chicks. 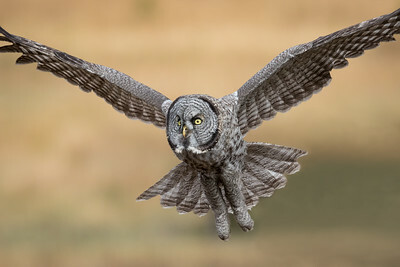 It has long been a dream of ours to photograph Great Gray Owls (Strix nebulosa) in the wild. 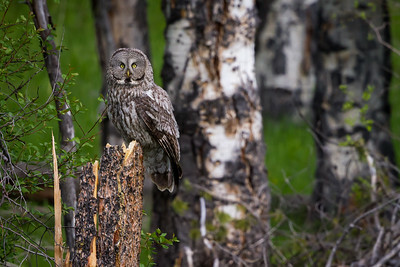 We were fortunate enough to find a nesting pair with chicks in Wyoming. 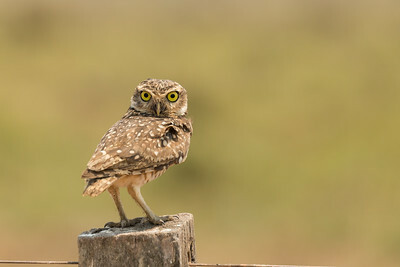 We observed them from a respectable distance for several days as they allowed us to photograph them. 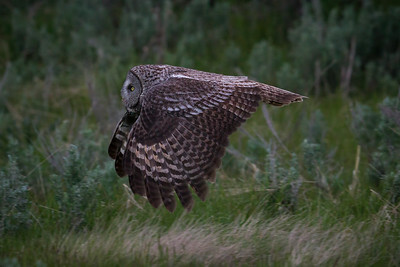 This one strikes a regal pose after devouring a vole just after twilight. 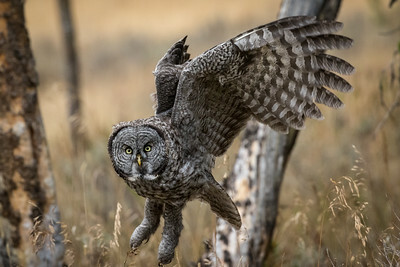 A Great Gray Owl flys toward us while seeking a perch to survey a meadow for voles, Yellowstone National Park. 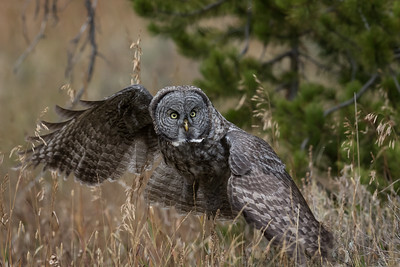 A Great Gray Owl flys low over a meadow in Yellowstone National Park. 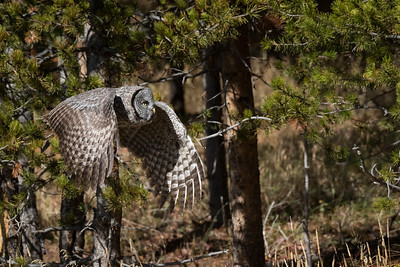 A young Great Gray Owl silently glides through the forest in Yellowstone National Park.